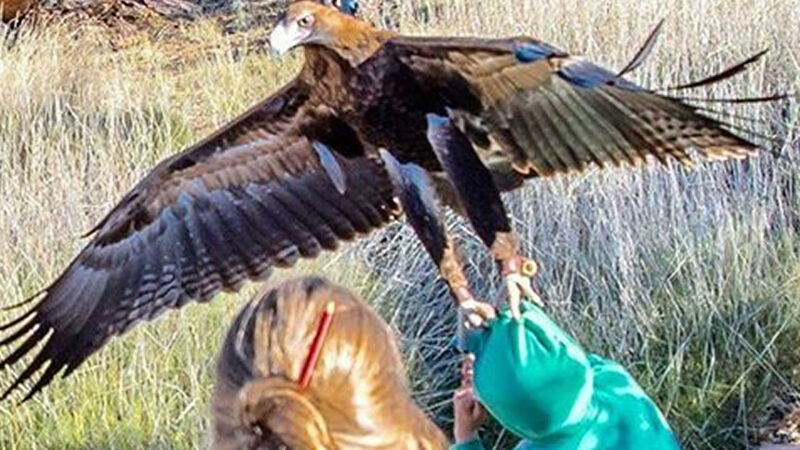 An incredible image captured the moment a Wedge Tailed Eagle lunged at a young boy during a birds of prey show in northern Australia on July 6. The incident happened at Alice Springs Desert Park when the bird flew over the crowd and swooped down on the boy. He and his family were visiting from Albury Wodonga, Victoria. "At a nature park in Alice Springs we decided to go to a bird show the young boy in the green kept pulling his zipper up and down. For some reason the Wedge Tailed Eagle did not like it and instead of flying over to the log he is meant to for a photo opportunity he flew straight at the young boy and attacked him. The show was quickly cancelled and the boy taken off to first aid. Those talons are huge he was a very lucky young boy." The boy reportedly suffered superficial wounds to his face. The show quickly wrapped up after the incident.